There’s good news for those of you stuck in the past, longing for the days when voluptuous sheet metal and big block engines ruled the highways of America. 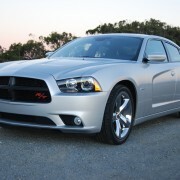 Dodge has recreated the magic of those golden days of yore with the Charger R/T. It’s a sizeable sedan, with 4 cavernous doors that open wide to accommodate 5 adults, plus a 16.5 cubic foot trunk to haul all their stuff. Somehow, Dodge engineers have managed to wrap all that practicality in an alluringly sculpted skin that looks lean and mean. 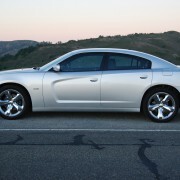 Charger’s styling renaissance dates to 2011. 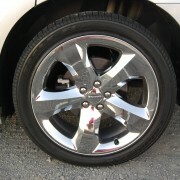 Conspicuously reflective chrome clad alloys, 20 inches in diameter, 8 inched in width, and carrying chunky 245/45R20 Goodyear F1 tires, play off the subtle contours of the revised body. 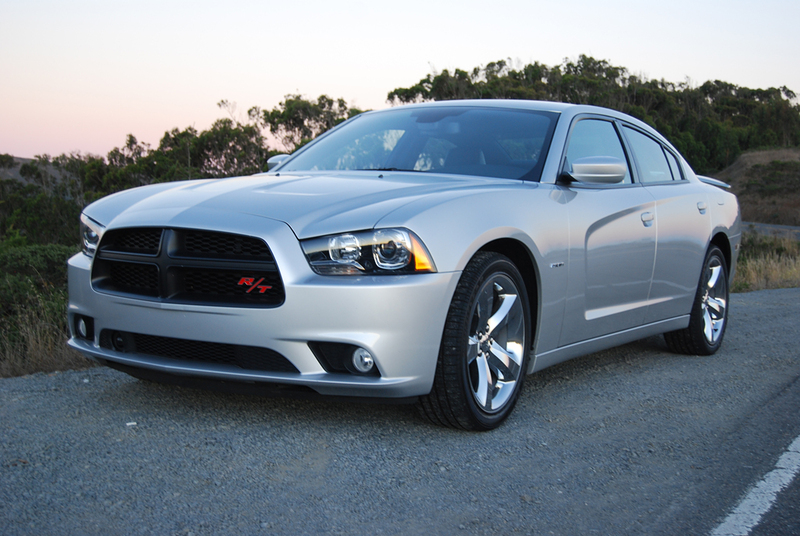 Dodge has given the new Charger a redone interior that looks handsome, feels good to the touch, and most importantly, works well in everyday use. A satisfying combination of expensive leathers, suede and surface treatments remove Charger from the airport rental fleet and elevate it to the exotic loan portfolio. 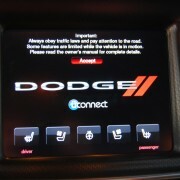 The central touch screen video unit, about the size of an iPad, works flawlessly to control most functions you’ll need to adjust, including climate, radio, telephone, and personalized settings. Redundant buttons are splayed across the dash to allow immediate access to such essentials as fan speed, temperature, and defrosters. There’s even a real, grabable knob for radio volume and a matching one for station selection, with supplemental controls available on the steering wheels spokes. If you can’t figure out how to get the job done in this cockpit, then you don’t need to do the job. We spent 3 hours in this environment on a drive from the Bay Area to the Gold Country foothills, and another 3 hours on the return trip. 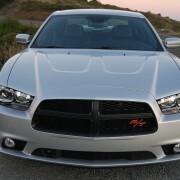 The Charger performed flawlessly, churning out more than enough passing power from its 5.7 liter HEMI V8 to snuff slower traffic in an eye blink. 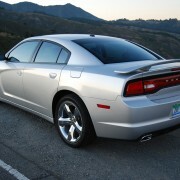 Yet the cruising gate of the Charger consumed less than half a 19 gallon tank of fuel for the entire round trip. 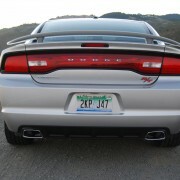 At a steady 65mph, the Dodge managed to score a miserly 25MPG while whistling down the Interstate with quiet precision. 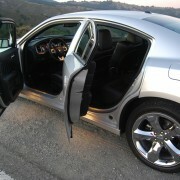 On twisty backroads, the Hemi Charger is an even more invigorating blast to drive. Tromp the loud pedal and this beefy beast explodes with massive forward thrust. No need to downshift unless you want to savor the experience of swapping cogs. The Hemi makes enough torque in any speed range to get the job done right now with nothing more than the automatic kickdown that occurs whenever you floor the accelerator. 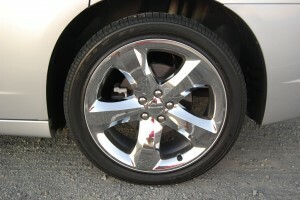 If you live in snow country, you can equip your Charger with optional all wheel drive. 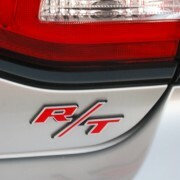 The allure of the Charger is enhanced by the addition of the R/T package, which adds $4,000 to the car’s modest $29,995 base price. This 29R option group makes the Hemi work harder and the cockpit feel better. 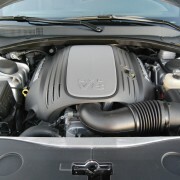 The motor receives a more efficient computer control box or “High Speed Engine Controller,” plus “Customer Selectable Sport Mode” for increased engine, gearbox and suspension responsiveness. 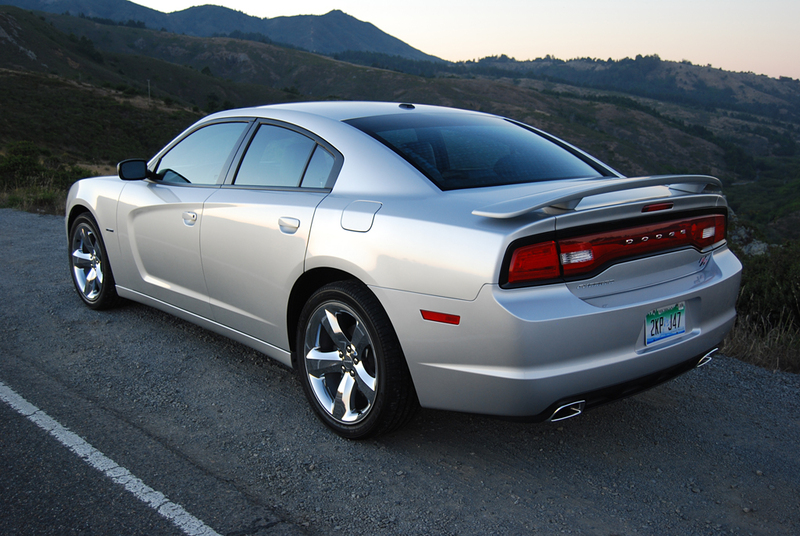 The R/T package adds a 3.06:1 differential gear, paddle shifters on the steering wheel, and lovely ventilated suede front seats to the sporting mix. The Super Track Pak, a bargain at $400, not only stiffens the suspension but also quickens the steering ratio. The downside of these handling improvements is a choppy ride that constantly reminds you that your Charger is more ready to boogie than browse.